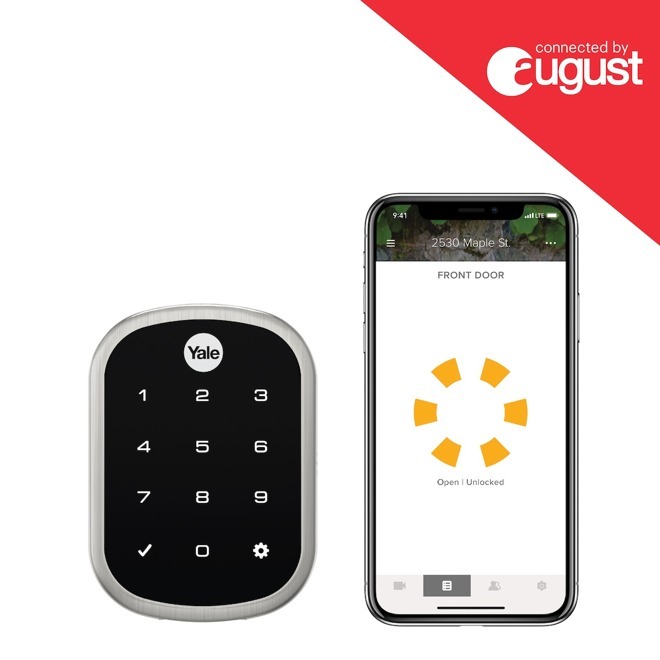 August has teamed up with Yale to launch a new line of keypad smart locks that bundle August's cloud-based software and app with Yale's well-known hardware. "Assure Locks - Connected by August" let users gain access to their homes by using either the August app or a physical entry code. HomeKit support allows them the ability to be unlocked via Siri, through the Home app on iOS or macOS, or included in automation routines. Jason Johnson, CEO, and co-founder of August said: "this new Yale Connected by August lineup is simply the beginning of what we will accomplish together when it comes to innovating the lock industry." Two models are launching the Assure Lock SL with an edge-to-edge touchscreen keypad at $299 and the Assure Lock Touchscreen with a numeric touchscreen as well as traditional key access at $279. Those who already have a Yale lock can upgrade by purchasing the Connected by August kit for $129. This new line comes roughly a year after August Home was acquired by Assa Abloy, the parent company of Yale. Yale has offered HomeKit equipped locks in the past, but thanks the August, these are the first with auto-unlock that will disengage the lock as it is approached. The two new locks are launching on Yale's website on Tuesday and will be available at additional retailers mid-October. Those interested in August's existing locks —like the well-reviewed August Pro —can find them widely available.